What now for bees in the UK? Previously, I reported that the EU approved 2 further next generation neonicotinoids: Sulfoxaflor and Flupyradifurone despite earlier EFSA conclusions and restrictions. You can read more about here. "....on 9th October 2015, the European Commission authorised Flupyradifurone, a new neonicotinoid insecticide...........Francesco Panella, president of Bee Life, criticized the schizophrenia of European Institutions, restricting the uses of certain molecules for their risk to bees and gaps in knowledge, while authorising similar molecules in the same situation." Many times I have stated in my blogs that without meaningful changes to the regulations, we are simply banging our heads against a brick wall. Large agrochemical organisations can afford to keep bringing out new poisons ad infinitum. For all the bleating about development costs, sales are in the $£billions. The UK government attempted to block any EU restrictions to neonicotinoids. However, things have moved on in the UK since that time. For instance, farmers were denied their two most recent “emergency requests” to use neonicotinoids (of 3 emergency request, only the first was granted), and the UK “bee scientist” went to join her former DEFRA colleague at Syngenta – this was widely publicised, and you can read more about it here. Things have also changed politically - for example, there is a new DEFRA Secretary. Campaign for genuinely wildlife friendly farming. Harness the increasing evidence that farmers themselves are becoming concerned about soil fertility due to chemical use – see this example (can be slow to download and opens in a new window) and use this in communications with DEFRA – how are DEFRA going to help farmers address these concerns? A ban on neonicotinoids, and campaign for a complete overhaul of the regulatory system with honest and transparent testing. Campaign for farmers to have unbiased information regarding “pest threat” – instead of relying on agronomists – 50% of whom work on commission from agrochemical companies (according to evidence given at the UK EAC inquiry into this issue). Make it illegal to promote or use insecticides in the absence of pest threat, and to mislead farmers about the degree of pest threat. 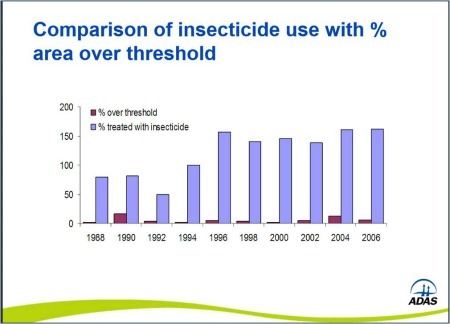 The chart below illustrates that farmers were using pesticides disproportionately to the level of threat from ‘pest insects’. I realise some people would like a total ban on all pesticides. However, I think that encouraging and rewarding wildlife friendly farming, ensuring proper information for farmers and a stronger regulatory framework would result in a dramatic reduction in pesticide use, and eventually, better methods, such that the methods used today could become obsolete, and be replaced quite naturally with wildlife friendly methods. But try beating farmers over the head with a stick and you'll get nowhere. What About Bees Following Brexit? However, in the event of Brexit, then, as a number of conservation organisations and scientists state; there is a chance to use this as an opportunity to gain additional protection for wildlife. There is general agreement that the Common Agricultural Policy (CAP) needs to be revised. If we fail to seize this opportunity, we only have ourselves to blame! Campaign to review the CAP to reward and support farmers for genuinely wildlife friendly farming practices (rather than giving taxpayer funds via the EU CAP to Saudi horse breeding princes as the current system has allowed, for example. Again, we should demand farmers are given unbiased information as previously described. Demand a ban on neonicotinoids: 81% of those who voted to leave the EU (and 88% of those who voted to remain) want to keep the EU ban on neonicotinoid pesticides that have been found to pose a threat to bees - according to an opinion poll by Friends of the Earth. - The agrochemicals industry pays a research fee to a government body for testing – probably the Chemical Regulations Directorate. But since we cannot trust our ‘government bee scientists’ it needs to be overseen by a further independent body with no connection to the NFU or agrochemicals industry. - The government body allocates the testing to appropriate Universities. - The tests are conducted on a ‘blind’ basis: the University must not know whether or not they are testing a chemical, or the ‘control’, and the commercial organisation must not be made aware which university is conducting the tests. - The results can then be made public and open to scrutiny. - These are my initial ideas, and perhaps need some work, but it would provide universities with additional income, they woudl have to remain free from corporate influence as a prerequisite to be eligible to perform tests, and we need to have confidence in the system. So I'll finish with a point made by Buglife, the Invertebrates Conservation Trust - but they are only one of a good number of genuine conservationists speaking out on this opportunity to improve UK wildlife protection - we miss it at our peril!